I enjoy a morning cup of coffee just as much as the next guy. The smell, the taste, the variety. What I love almost more than a good cup of joe is the coffee shop it's served in. Living just out side of Chicago, there are no shortages of cute shops. Finding caffeinated spaces has become a sort of pass time for me. A few weeks ago I stumbled upon Brewpoint Coffee Workshop & Roastery. This charming local business is the definition of a hidden treasure and I want more people to know about it! Tucked behind a strip mall in Elmhurst, IL this loading doc turned coffee shop is my new favorite place for coffee and conversation. The space it self is breath taking, the type of place you'd want to sit in all day because it makes you feel cute. 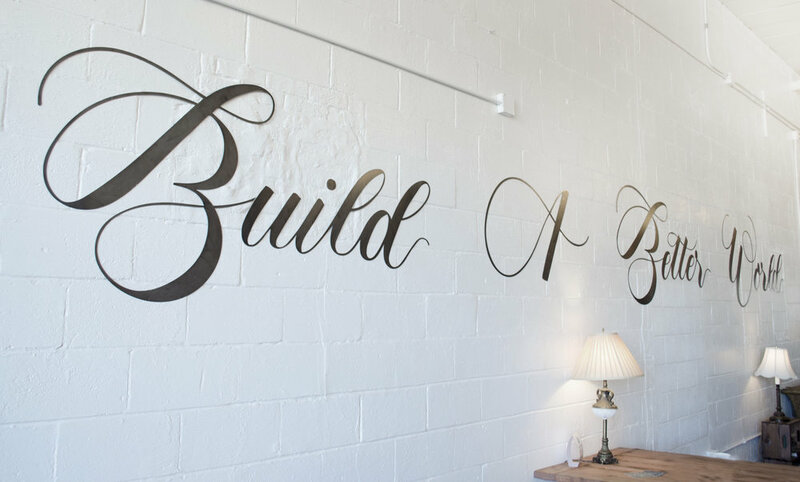 The owners passion for their coffee shop shines through in the details. 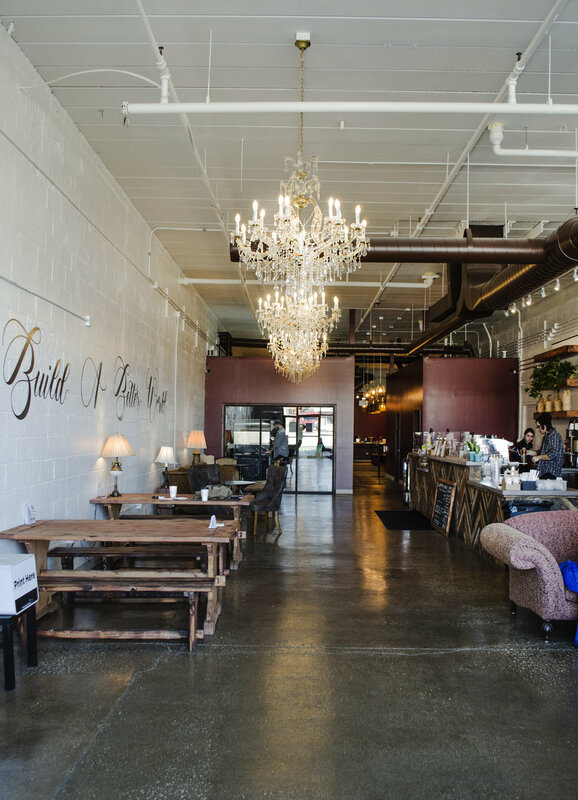 They've kept its industrial feel while cozying up the place with vintage furniture, hard wood everything and added elegance with chandeliers you'd want to swing from. I've always appreciated a neatly written chalk board menu. It's trendy yet functional. I am still in awe and super excited that a place so, dare I say, 'hip' exists in the suburbs. 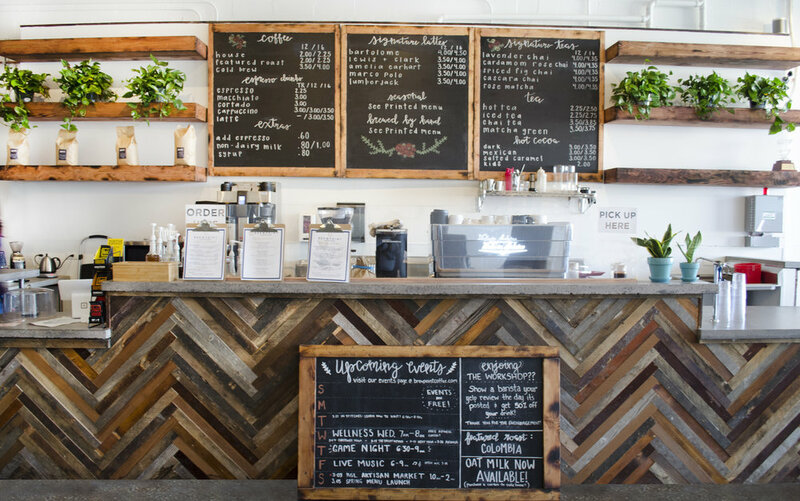 Brewpoint's coffee is roasted in house and served by some of the friendliest baristas. During my first visit I wanted to try all that Brewpoint had to offer so I kindly asked the nice man behind the counter to pick a hand full of their best beverages with variety in mind. I'm assuming this wasn't the kind of order they got every day but let me tell ya, he done goooooood. I ended up with a Lavender Chai Latte, Amelia Earhart ( a signature drink with espresso, whole milk, I got mine with almond milk, honey and cinnamon), a Matcha Green Tea Latte and my personal favorite and new drink of choice the Bartolome. The Bartolome is also a signature drink of theirs consisting of espresso, oat milk, and sweet nutty sweetness. It had just the right balance of sweet and savory that reminded me of a roasted marshmallow. Did I mention Brewpoint offers a TON of non dairy milk options? Something I overly appreciate about a coffee shop. All of the drinks were so unique, made my mouth happy and left me with a major caffeine buzz for the rest of the day. What I love most about this little hidden treasure, is their emphasis on creating and empowering authentic community spaces. 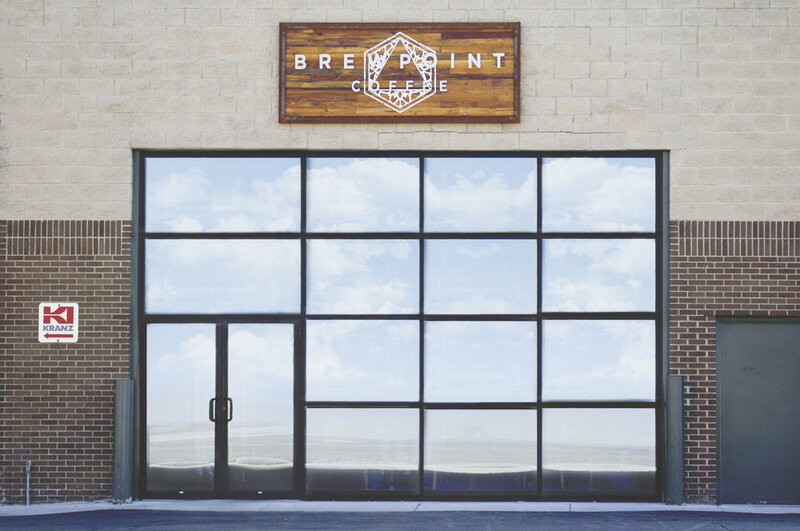 Coffee shop by day Brewpoint turns into an event space by night. How cool is that? This self made business not only values quality coffee but also quality time. In a world of DMs and followers, it's nice to find a place that encourages face to face encounters. Even as somewhat of an introvert, I crave more businesses like this. 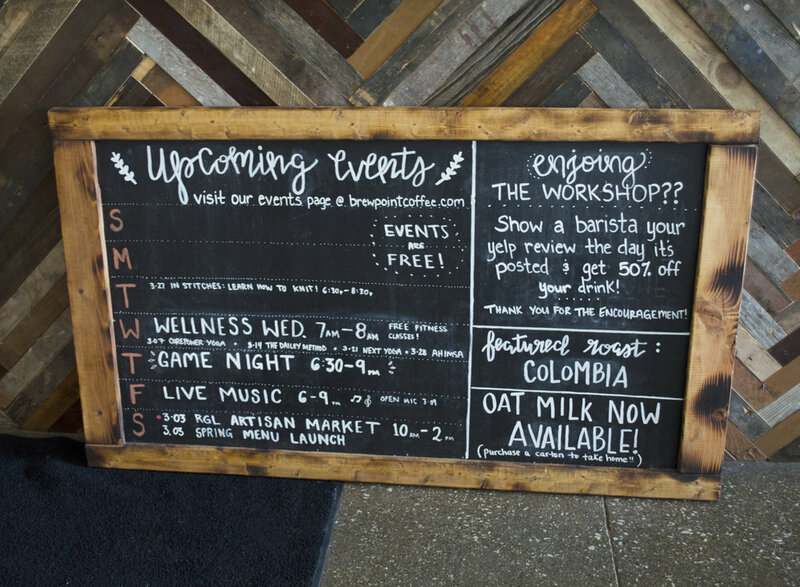 So local businesses take note because Brewpoint Coffee Workshop & Roastery is doing something right. 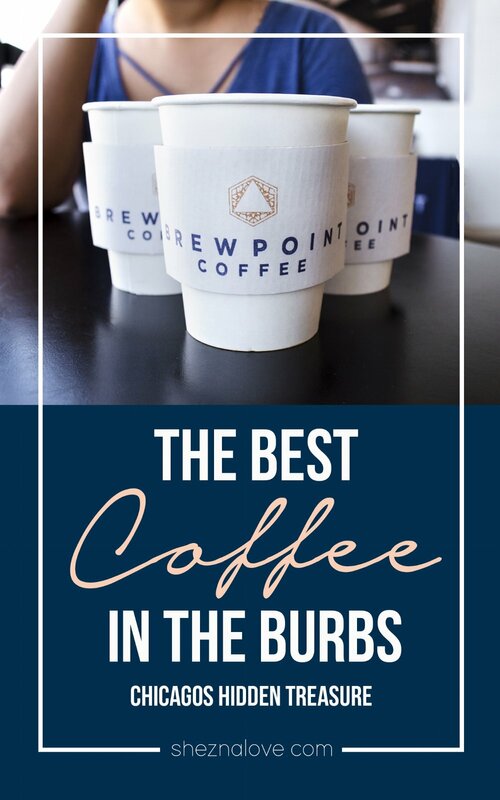 They have one other coffee shop location, also in Elmhurst, as well as a presence in the Elmhurst Public Library. I'll leave the website and address bellow for anyone who wants to check this place out and maybe I'll see you there!